The Bentleys take their growing very seriously with a high regard for the sustainable use of all the resources on their farm including water, soil and air. Production methods using natural, biological and cultural processes are used alongside modern technology which ensures the pears, plums and apples are at their very best w hen ripe and above all else have been farmed with great care. 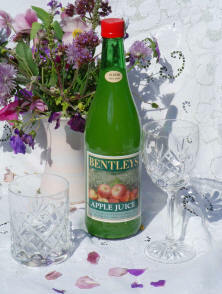 The farm is split into four major growing areas; half for dessert apples, pears and Bramleys. A quarter for plums, a quarter for cider apples and squeezed in amongst them a very small plot of cherries. The varieties grown are numerous including Victoria, Herman, Opal, Reeve, Avalon, Majorie Seedling and Valor plums. Elstar, Cox, Egremont Russet, Jonagold, Braeburn and Gala apples plus Comice and Conference pears. Michael’s favourite is the Gloucestershire apple Ashmead Kernel. Christiana enjoys an Avalon plum because they are so sweet and juicy. However, above all else Michael and Christiana have a real love for what they do and their produce speaks for itself. Their dedication ensures the production of the highest quality plums, apples and pears that are some of the best you’ll ever taste. 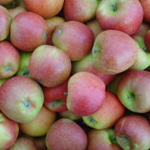 Don’t just take our word for it – why not visit Primrose Vale from July onwards for Castle Fruit Farm’s great tasting Gloucestershire orchard fruit?